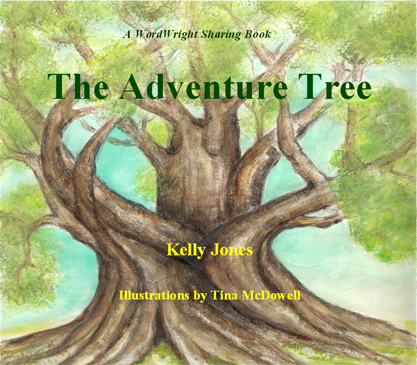 WordWright.biz announces the publication of The Adventure Tree by Kelly Jones. Come with Willow and Zak on an adventure. Travel with them to a mysterious island. Meet a talking monkey. Then make your own adventure. The Adventure Tree is the first of a series of books that will follow Willow and Zak to places you never imagined. . .but can. Jones creates a world of wonder and enjoyment for children ages 3 to 8. Jones is the mother of two terrific children, and you’ll enjoy sharing her dream with your children and grandchildren. She’s worked in the field of Ophthalmology most of her adult life but felt the need to do something for children. Not quite knowing what or where to begin, she volunteered at Sunday school, but as it turned out, she began getting more out of it than the kids! ***Thank you for your support. Please know that a portion of the proceeds from the sale of each book go to charities that directly benefit children.